LONDON -- Jaguar touts design, a roomy interior and fast-charging as game-changing features in its I-Pace full-electric crossover, which goes on sale in Canada during the second half of 2018. The production i-Pace closely follows the design of the concept unveiled at the 2016 Los Angeles auto show, blending the height and angular lines of an SUV with a coupe-like profile. It is built on a new aluminum architecture that packages its 90kWh lithium-ion battery, under the floor between the two axles. The arrangement allowed Jaguar to design a car with short hood, roomy cabin and a more aerodynamically efficient squared-off rear end. Design Director Ian Callum said the I-Pace’s electric drivetrain gave stylists unprecedented freedom. "Starting with a clean sheet enabled the dramatic cab-forward profile, unique proportions and exceptional interior space," Callum said. "We wanted to design the world’s most desirable EV, and I’m confident we’ve met that challenge," he said in a statement Thursday as the automaker unveiled to I-Pace during a Web livestream. Jaguar says that the I-Pace’s interior space, matches that of a large SUV. It's similar in length to Jaguar’s XE midsize sedan at 4.67 metres (184 inches). The Tesla Model X is much longer at 5.05 metres (199 inches), which puts it in a bigger category. The Jaguar sits on 22-inch wheels to increase the height to 160 cm (63 inches), but is still lower than the Tesla Model X at 167 cm (66 inches). The I-Pace uses an electric motor on each axle to give the car four-wheel-drive. The combined power output is 394 hp, giving an acceleration time of 0 to 97 km/h (0 to 60 mph) in 4.5 seconds. The batteries can be recharged to an 80 per cent charge in 85 minutes on a 50kW charger, Jaguar said. The car is also compatible with DC 100kw rapid chargers, which half the charge time. Total range is 398 miles based on the new WLTP protocols, which began to replace the more generous NEDC measurement system last September in Europe. 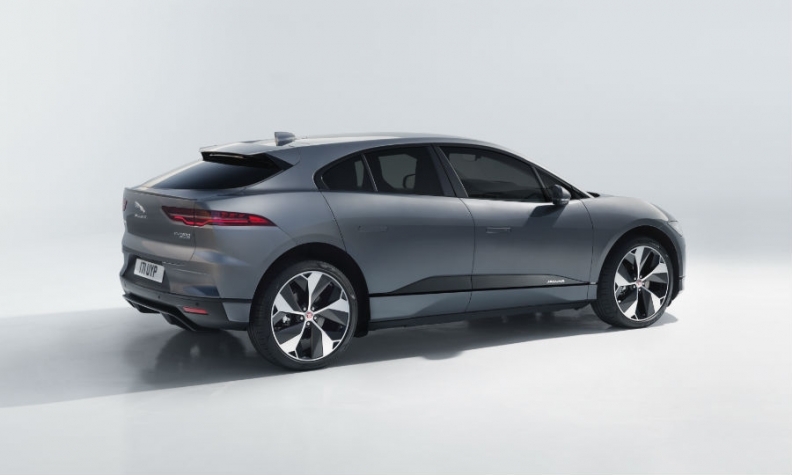 The I-Pace will drive almost 483 km (300 miles) on a single charge, Jaguar said. The I-Pace’s technology includes a new version of Jaguar’s Touch Pro infotainment system that allows over-the-air software updates for the first time, matching Tesla. The satellite navigation system stores information on previous journeys and personal driving styles and assesses that against the topography of the set route to give a much more accurate battery range calculation, Jaguar says. Jaguar will launch at the same time a skill for Amazon’s voice-controlled Alexa app to allow the owner to quiz Alexa-enabled devices about the status of the car, for example the amount of battery charge left. Canadian pricing will be announced in late March, according to a JLR Canada spokesman. The car costs 63,495 pounds ($87,000) for the entry S model in its UK home market before a government EV purchase incentive. A fully specified First Edition costs 81,495 pounds. The pricing puts the I-Pace in the same cost range as Jaguar’s XJ sedan. The I-Pace is built in Austria by contract manufacturer Magna Steyr. Jaguar is ahead of its German premium rivals to produce a luxury electric car. Audi will unveil its e-Tron electric SUV in summer while Porsche’s Misson E sedan is expected late this year.